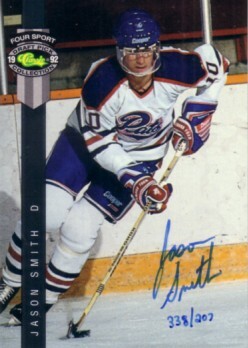 1992 Classic Four Sport certified autograph card of former Regina Pats star Jason Smith, who has gone on to a 15 year NHL career. Numbered out of 2070 produced (card incorrectly says 207). NrMt-Mt or better. ONLY ONE AVAILABLE FOR SALE.